Maj. Gen. Gregg Sturdevant, left, and Maj. Gen. Charles Gurganus were asked to retire in the wake of last year’s attack on Camp Bastion, Afghanistan. Two Marines died during the incident and six AV-8B Harriers were destroyed. Appearing before members of Britain’s Parliament on Tuesday, a top British general disputed assertions that his forces are to blame for the security failures that led to last year’s deadly Taliban attack on a coalition airfield in southwestern Afghanistan. Lt. Gen. David Capewell, who oversees the planning for British military operations abroad, told lawmakers that even though the Brits were in charge of security for Camp Bastion at the time of the attack, they are not responsible for the deaths of two Marines gunned down after 15 insurgents breached the base perimeter in September 2012. His testimony before Parliament’s Defence Select Committee was reported by The Independent, a British news agency. 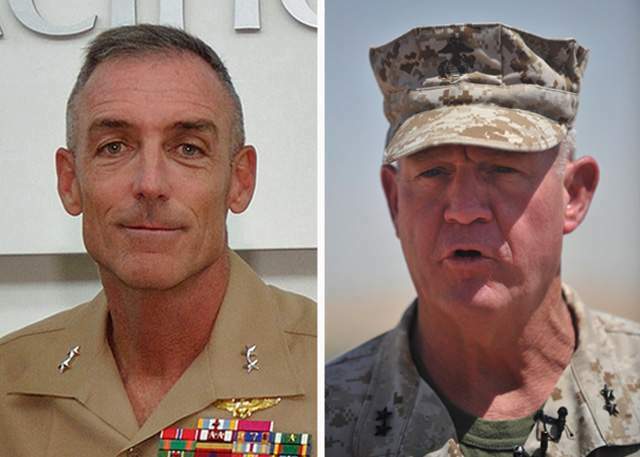 Two senior Marine Corps officers, Maj. Gen. Charles “Mark” Gurganus and Maj. Gen. Gregg Sturdevant, were asked to retire this fall after the results of a U.S.-led investigation concluded they should have done more to ensure Bastion was safe from such an attack. U.S. officials also pointed out that the Brits’ command structure was separate from the Marines’ principal headquarters, which is based at the adjacent Camp Leatherneck. Because of this, there was not a single commander overseeing security for the whole complex. After the U.S investigation was released in October, questions were raised in the UK as to whether any British officials also bore responsibility for the attack. British officers had recommended a protective fence be built around the airfield following an earlier suicide attack. But Lt. Gen. Capewell said that a “ditch and berm to prevent vehicular access” had been approved instead, and insisted that no request for extra protection had been. When reminded that more than half the guard towers were empty on the night of the attack, Lt. Gen. Capewell replied: “He who defends everything defends nothing.” … Requests for greater protection had not been denied and the US report was wrong in stating otherwise, he insisted. At the hearing Tuesday, Capewell addressed those allegations by saying that although British mistakes contributed to security failures at Camp Bastion, “there is no culpable failure on the part of UK forces,” according to The Independent. With a commander in chief who cares nothing about our troops I have no doubt that he was the reason there was no better security at the base. Are you serious? Do you even know a thing about the military other than what you’ve read? If the officers present weren’t culpable, then how in the hell can the president be? I get you don’t like Obama and I don’t care about your reasons, but to make a statement so ridiculous just shows how petty you are. Your post is the type of comment you’d expect to get from a spoiled little brat kid “I’m mad at you mommy, now I don’t like you”. Obama has many faults, but to paraphrase the UK Gen. If you’re to blame for everything, then you’re to blame for nothing. Everyone is entitled to their opinion, but think before you speak. Adding to Mr. Herrington’s comment, anyone’s failures including yours cannot not be blamed on someone who had nothing to do with it. Mistakes happen and these Marines who fight hard and bravely do not deserve to hear your unproductive comments.